Doesn’t virtually every woman on the planet want to look like Marilyn Monroe? 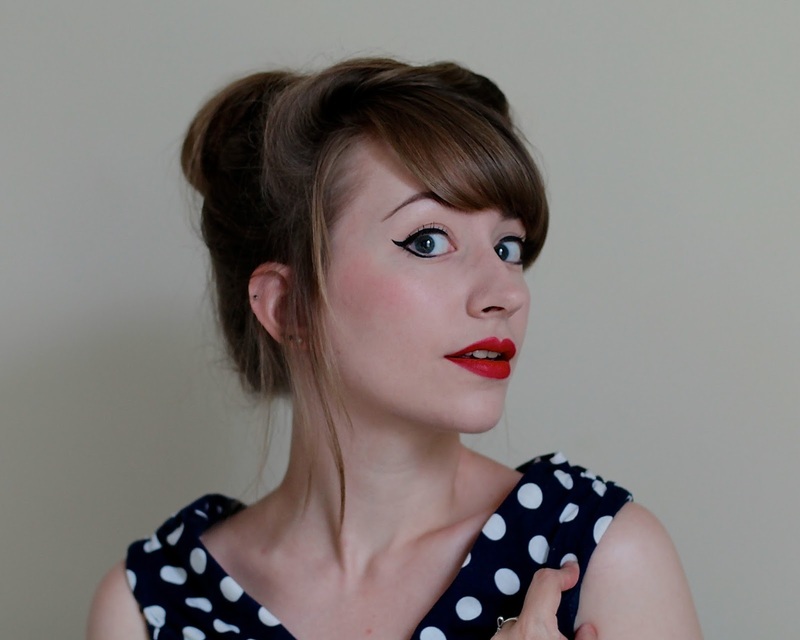 To be frank, if I looked 1/10th like her I’d consider myself a very lucky girl. And yes, I realise she did have some cosmetic surgery and I’m not suggesting we all go around chopping our noses up, but hey, each to their own and I can appreciate a masterpiece of a face when I see one. What I’m getting at is if I’m told Marilyn wore it, I’ve probably handed over my money before I’ve found out what ‘it’ actually is. In this case, it’s clever marketing as while Besame claim this was ‘Marilyn’s ‘favourite’ what they actually mean is ‘this is a shade we created that copies as closely as possible what she wore during Some Like It Hot’. 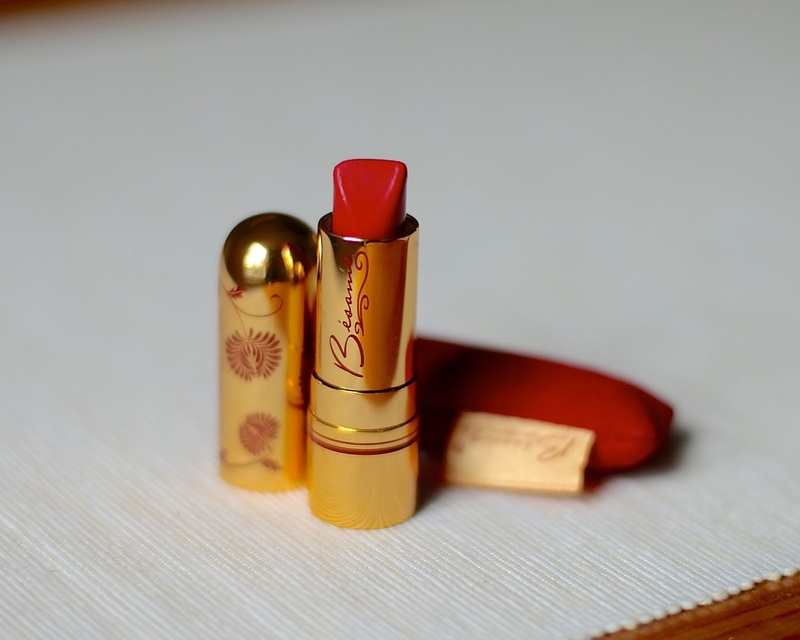 Besame themselves are a modern company so weren’t around when Marilyn was, but they do strive to make genuine reproduction products, which is probably why everyone on the vintage scene loves them. Anyway, this is Marilyn’s shade because it’s bright, bold and has warm undertones, unlike most of Besame’s other reds which seem to be bluer. However, despite the fact it supposedly has orange in it, on me it applies as quite a neutral red that is a lot richer/deeper than most of my others, so I think it might well work on those that have more pink in their skin than me too. I could go on at length about this lovely little lipstick but let’s make things shorter with my usual bullet points. I do enjoy a bullet point. I don't have this particular shade but I'm slowly amassing quite a large collection of Besame products. I love love love them but I hear you on the price – they're soooo expensive here in the UK! I personally love the shape as I find it super easy to get a neat application without using a lip brush – but it's definitely different to get used to compared to a modern lipstick. 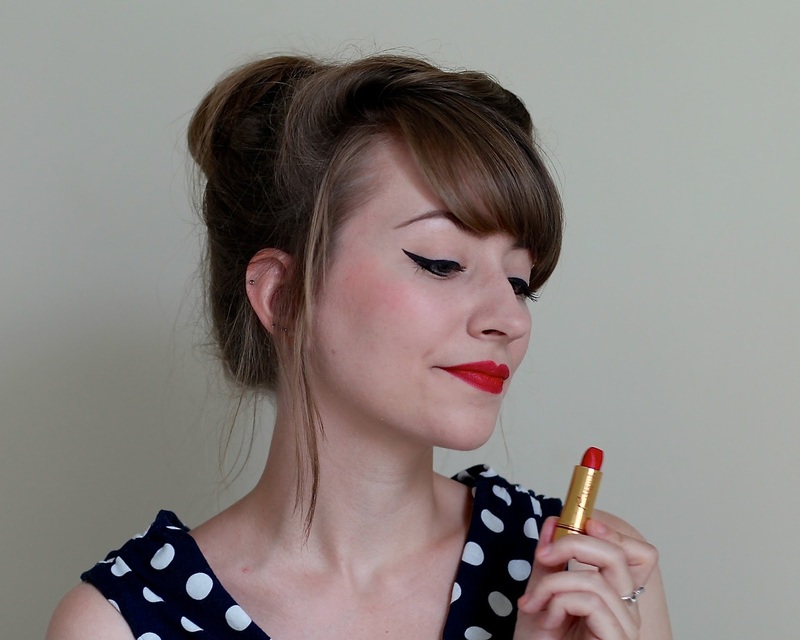 I love the quality of this lipstick – it's truly fantastic – and I'd love to try so many other things from the range but I just can't find the money each month! Porcelina's said she loves the shape too – I must be doing something really wrong, or I'm set in my ways!! I've got Carmine, Portrait Pink, Dusty Rose in full size, and then most of the 'reds' in sample size pots. I think they're fabulous! I actually find the bullet shape helps me apply more precisely, I find lip brushes a faff. I'm wearing a Besame colour for the wedding, can you guess which one?! I got some sample pots when I went to a shindig at the WKD boutique in London once, we drank cocktails out of teacups before it was trendy and I had a nice chat with a burlesque dancer and some vintage makeup experts. I have been wanting to make one my own since I saw it about 5 years ago on Youtube but haven't been able to justify the price just yet…One day…. It's a real investment – I'd love to be let loose on a stand like we saw at London Edge and try everything!! Aw, that's one of my favourite compliments ever because I've been trying quite hard to polish up my writing on my posts and stop focusing entirely on the photos 🙂 It's so nice to hear you like it! Red is perf on you! I've got Carmine and Merlot and love them both – I'd have loved the latter back in my gothier days. The price really bothered me at first, but I think they're worth it as long as you get the right colour, so they're definitely ones to try on in person first. Besame is too pricy for online on-a-whim purchases! I remembered you saying that as I wrote this post so I was hoping it would help you out 🙂 I really want the rouge! I think this shade photographs better than I felt it looked in real life, weirdly. And I've got other lipsticks I love in real life but don't like in photos. Dilemma!! What a little beauty! I would love one or all of the colours, but really ordering makeup online without trying is a big no no for me! This shade looks very becoming on you. And the lipstick isn't bad either 😉 hehe! I've been stung so many times by ordering things online that don't look right at all… and yet I still keep doing it! Hmm maybe this one would work for me! But YIKES I can see why you wouldn't want to buy them all that often. I checked a site here ( Canada) and they are $27 so really not that bad. Then even better I found a store that carries a few of Besame's products in the city( London,Ontario actually). I don't go all that often but I might have to put giving this a lipstick a whirl on my "things I need to go to the city for" list. I think you're getting a much better deal than we are 🙁 But yes it's the not being able to try them on that's the real kicker – there's nothing I can do about that! 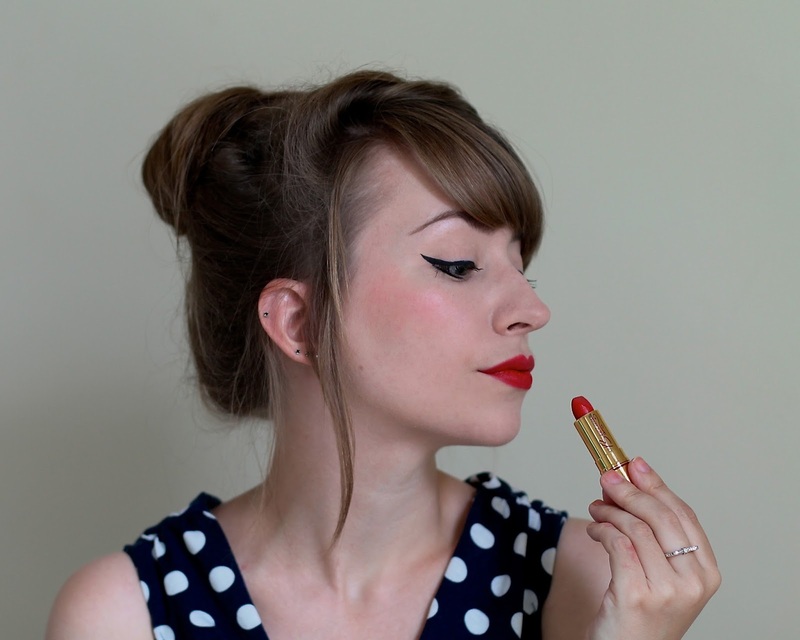 I have been looking at all the lovely Besame products, but, like many people, I am worried about splashing out without being able to try it and ending up with a pricy lipstick fail. It was helpful to read your review, this colour looks great on you. Glad to help 🙂 the texture is fabulous but the colours are such a gamble! You're far too hard on yourself! I think think you're gorgeous and way, way more than just 1/10th of MM in the looks department, my sweet friend. You're a total knockout!!! As much as I would love to, I haven't tried any of Besame's offerings yet either. They're very pricey, as you touched on, and given that I already have my perfect Red (which, itself, isn't that cheap – it's MAC's Russian Red), I don't know if a crimson shade would be my first choice from them. Perhaps a nice rose pink, if they make them. It's a brand I would love to try for sure and have been coveting for years. If I ever take the plunge and invest, I will be sure to let you know my thoughts on it/them. Thank you for the fabulous review – I really like, and appreciate, how you listed both the pros and the cons. I think that's fair enough! Platinum blonde certainly isn't for everyone and she doesn't have the 'interesting' kind of beauty, perhaps, that some of her fellow leading ladies did. I'm a fan, but I can completely appreciate why someone wouldn't be! I'm loving this shade of lipstick on you! It's quite bold but still looks very refined. You look exquisite, and the images are lovely. Thank you for the review. Just a thought – only needing minor touchups throughout the day means using less lipstick. The time it takes to use up a tube of Besame is roughly equal to three tubes of MAC for me. So it's totally worth the price…cheaper in the long run, really. Great post, and you're rocking that lippie.